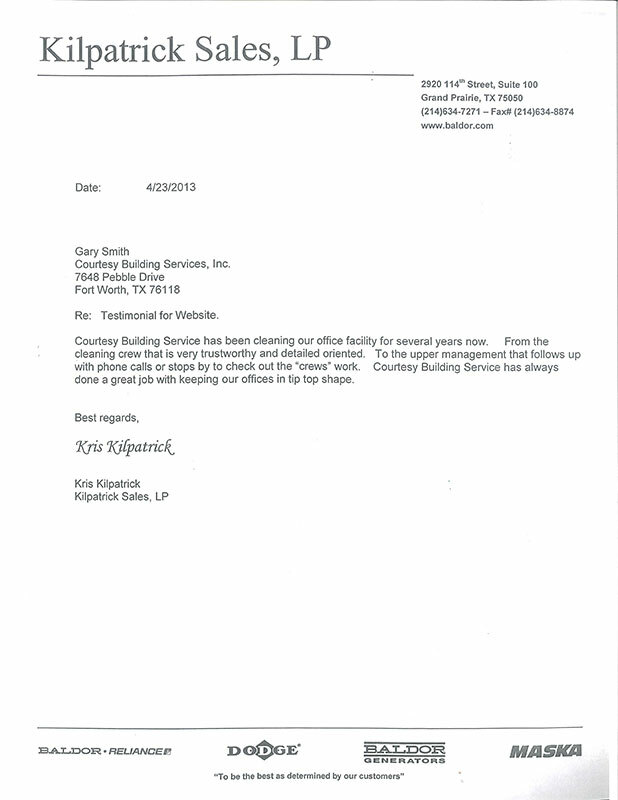 Cleaning Services Dallas, TX | Janitorial Services - Courtesy Building Services Inc.
Below are a few of our satisfied customers. 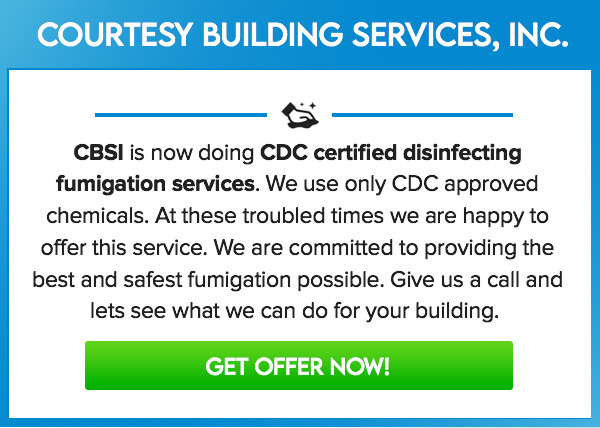 CBSI services several hundred facilities in the metroplex area, many similar to your facilities. Additional references can be provided on request. Evelyn, I would like to express to you what a pleasure it is working with Preston. Before Preston walked into my office and explained he was our account rep. I was looking and taking bids from other janitorial services. I decided to wait a little longer and give him a try before pursuing other avenues. His diligence and persistence to your cleaning standards are to be commended. He has excellent follow-up skills. At this point he is the reason I am no longer seeking another janitorial service. I know that people are always quick to complain and slow to praise. I just wanted you to know my thoughts on this matter. 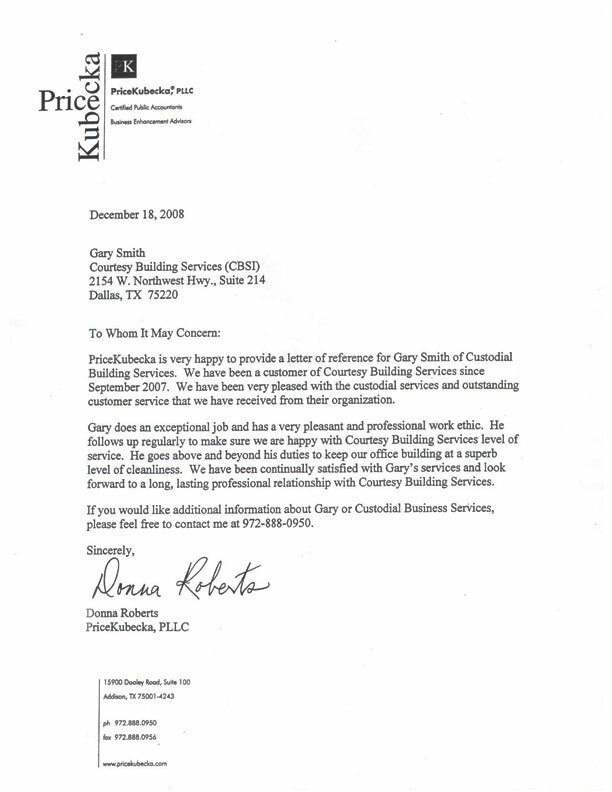 JJ of Dallas Mfg., Inc.
“ Price Kubecka is very happy to provide a letter of reference for Gary Smith of Courtesy Building Services. 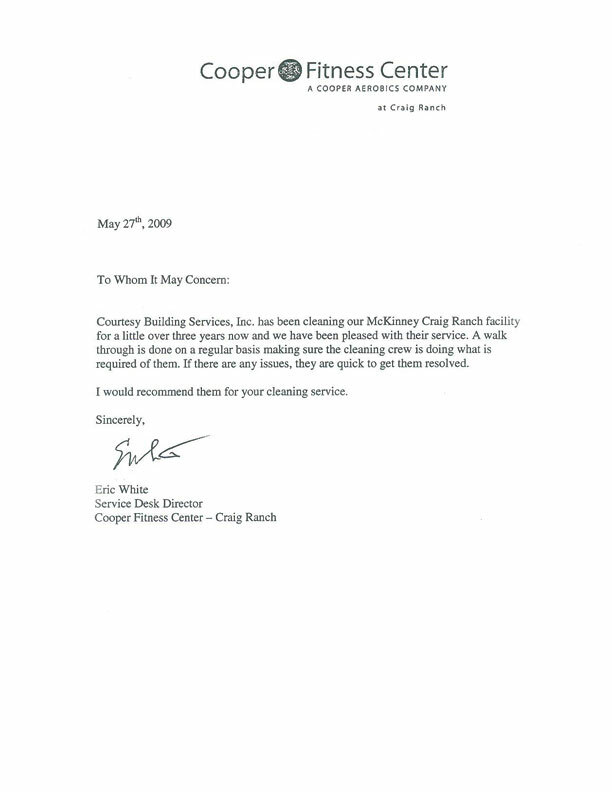 We have been a customer of Courtesy Building Services since September 2007. We have been very pleased with the custodial services and outstanding customer service that we have received from their organization. Gary does an exceptional job and has a very pleasant and professional work ethic. He follows up regularly to make sure we are happy with Courtesy Building Services level of service. He goes above and beyond his duties to keep our building at a superb level of cleanliness. We have been continually satisfied with Gary’s services and look forward to a long, lasting professional relationship with Courtesy Building Services." 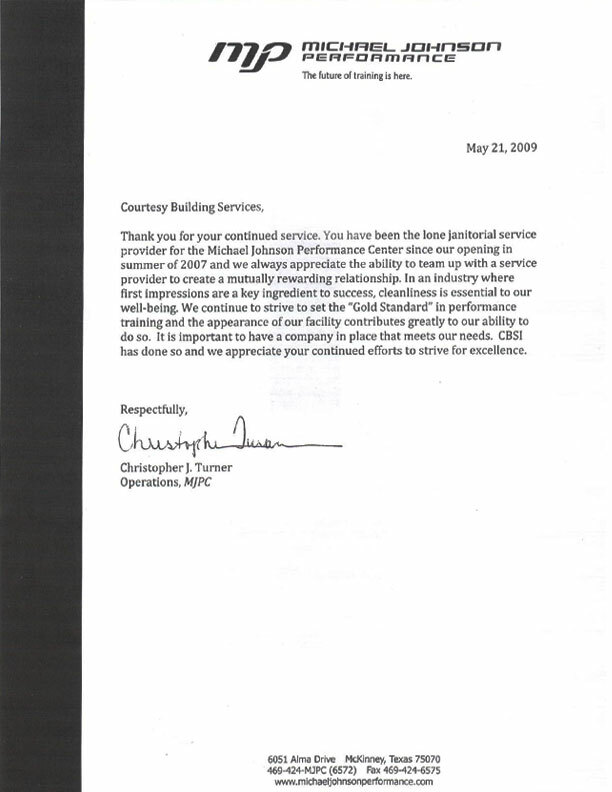 “ I am pleased to offer this letter of recommendation to Courtesy Building Services lnc also known as CBSI and Gary Smith. Gary and CBSI have been my Janitorial Service company since 2004 and are extremely dedicated, reliable, proficient and most importantly honest. Gary has taken pride in his work as well as representing CBSI. 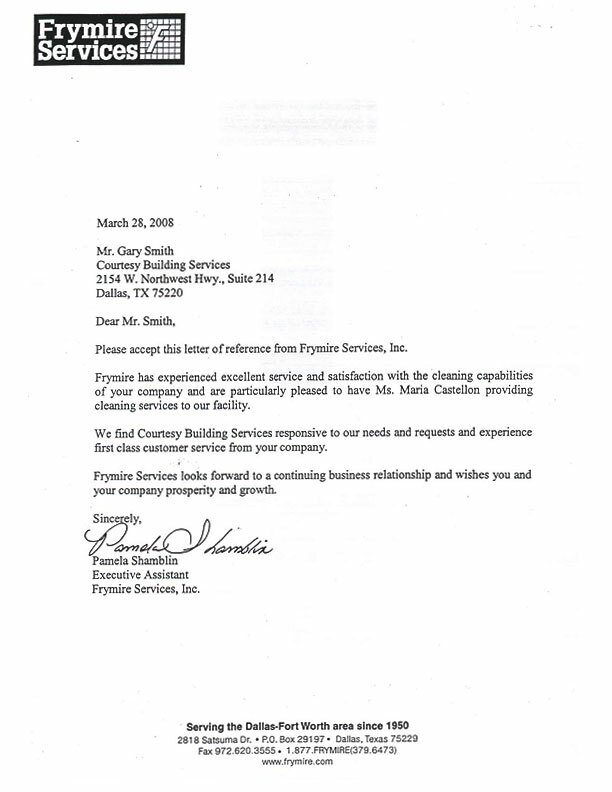 Gary is always going above and beyond to make sure we are taken care of and that we are completely satisfied. In all the years we have been doing business together, I have never had an issue that Gary has not corrected immediately. Gary exemplifies the words of quality and customer satisfaction. Gary is someone you can trust. Besides the Janitorial Service cleaning contract l can also rely on Gary for those extra handy man jobs that need to be performed around the office. Gary and his crew will change light bulbs, as well as, perform minor building repairs and maintenance. It is very convenient to make one phone call and know it will be taken care of and done right. I highly recommend Gary Smith and CBSI for all of your Janitorial Service and building maintenance requirements."